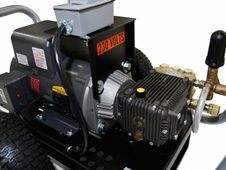 Make tons of snow at home this winter with the 7.5 GPM Electric snowmaking pump/pressure washer. When we designed the 6.0 GPM snowmaking pump we thought that would be the highest capacity pump our customers would want, we were wrong. Our customers demand the best and and so do we. If you want to make the most amount of snow in the shortest period of time this is the pump for you. At SAH™, integrity, quality and durability mean everything to us. We designed our own large pumps, utilizing superior components that could handle the strenuous demands of continuous use. 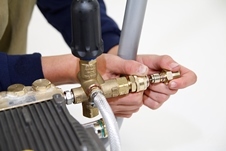 We encourage you to compare our high flow pumps to any pressure washer pump on the market today. We know you will be amazed at the quality and value you are receiving. The SAH electric pumps are ideal for when you want to make snow without the noise. A 220 volt outlet is required to operate our high volume pumps, but 35' of cord and up to 200' of high pressure extension hose can be used to get the snowmaker to the location you want. For night time snowmaking our 220volt pumps can't be beat. For the best in remote and portable snowmaking applications check out our SAH 6.0 and 7.5 Gas snowmaking pumps. When we couldn't find a suitable pressure washer on the market that had the high water volume needed for snowmaking, SAH designed its line of snowmaking pumps/pressure washers. Here at SAH™, integrity, quality and durability mean everything to us. We designed our own large pumps, utilizing superior components that could handle the strenuous demands of continuous use. 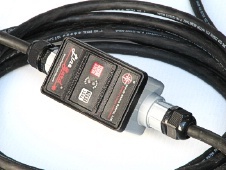 We encourage you to compare our high flow pumps to any pressure washer pump on the market today. We know you will be amazed at the quality and value you are receiving. Weather resistant, High Voltage on/off switch with cover.